The Student Senate prolonged recognizing the Rhode Island Student Climate Coalition organization and funding them as a student club last night. The Rhode Island Student Climate Coalition Organization focuses on green and sustainable practices and wants to promote awareness of environmental issues, climate change and social justice issues. The organization finds a connection between social justice issues and environmental justice issues. 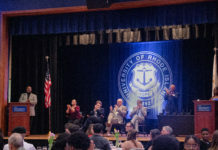 Through the club, Â members hope to make the University of Rhode Island a greener campus that can serve as a model of sustainability to other campuses. It also hopes to gain Leadership in Energy and Environmental Design (LEED) certification for building projects. S.A.S president Vanessa Garcia voiced that the social justice aspect of the organization was not a part of S.A.S. “There mission statement doesn’t align with what they are selling us,” she said. The Rhode Island Student Climate Coalition Organization expressed their focus to educate URI about sustainability practices in their mission statement, rather than voicing their goal to promote awareness on social justice issues. The recognition of the the Rhode Island Student Climate Coalition Organization will be debated again next Wednesday night. Student Senate also approved funding for the Students for Sensible Drug Policy to host their annual Hempfest. The organization has a live band party and invites a few qualified speakers to educate students and the community at large on policies and the usefulness of products like hemp. The organization obtains most of their funds from fundraisers and donations but required the help of the Senate to cover this years fees. While the Student Senate does not fund political events, Senate approved funding because Hempfest addresses social issues and serves to empower young people to become more involved in the political issues around them rather than advocating for a specific law or candidate. The URI fencing club received funding to purchase new box sets which are required for electric fencing during the competitions. The organization currently has one box set, but competitions require groups to have a minimum of two, otherwise teams have to pay a $50 fee. The additional box set will give the team more competition opportunities. The Fashion Merchandising Club at URI is having their spring fashion show and were granted funding for the events’ expenses. The group’s executive board asked for funding from Senate in order to leave substantial funds from their fundraising and events to be used for future expenses. Student Senate members prepare for Rhody Paws on April 29 as therapy dogs will come to the URI campus to help students relieve the stress of this hectic semester. Student Senate also held nominations for summer Student Senate which will be composed of five members and will meet so groups can function during the break.